When a home on Bird Key goes up for sale, it is a rare opportunity to live at one of Sarasota's most prestigious of addresses! There are only 511 home sites exist on this unique topical island. 291 have water access and 220 are off-water. "New Edzell", built by Thomas Martin Worcester, was the first Bird Key residence finished in 1914 on the then 12 acre site. Worcester's wife Davie never saw the completion of the three year project. The home was sold to John Ringling in the 1920's. Ringling's sister Ida occupied the property until her death in 1950. Arvida Real Estate purchased the property in 1959 to develop the property much as it is today. 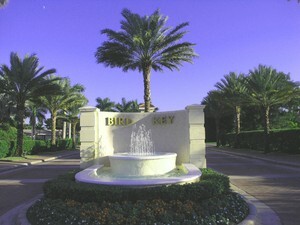 Bird Key's is uniquely situated between St. Armand’s and Lido Key to the west, and the Sarasota downtown to the east. Homes range from the 500's and can go well into the several millions. The Bird Key Yacht Club offers a complete club experience it' s members and their guests waterfront dining, tennis, swimming and boat slips. Check out the Bird Key Yacht Club or the Sarasota Yacht Club. websites for more information. There is also a nice brochure on the Bird Key Yacht Club which has more information as well. If your interests are more tuned towards a maintenance free condominium, Golden Gate Point is located just across the John Ringling Bridge and in full view of Bird Key. Street names include names like Meadow Lark, Owl, Blue Jay, Wild Turkey, Warbler, Bob White, Robin, Seagull, Mourning Dove, Meadow Lark and Partridge. So now you have a bit more understanding how Bird Key got its name!